Greetings All. You’re on this blog site because you’re interested in good beer, and especially good beer from Mac’s Brew. To satisfy your demand for beer knowledge, here’s all the news you need to know (for now). Please read responsibly! As I mentioned in my last newsletter, I’ve been so busy that brewing here has slowed down to the point that I currently have only three beers on tap (in 2018 I only brewed 8 batches/85 gallons of beer). I know, that’s just not right, but I’m taking steps to correct that problem. We had a Thanksgiving celebration here, with extended family present. Then on December 15thRosie graduated from Art Center College of Design (in Pasadena). We had a graduation party that night with family and friends in attendance. With these two parties, we emptied 3 out of 6 kegs, which is why we currently have only 3 beers on tap. But, the 3 beers are very good. I brewed an IPA three weeks ago, but it won’t be on tap until February. In early February Sheila and I are leaving for Santa Rosa. Yes, for the second year in a row, I will be going to Russian River Brewing on a Pliny the Younger quest. Last year there were four people (including me) in our party and we had a great time. This year our party has grown to nine people, and we plan to trek over to another Santa Rosa brewery after having our ration of PTY at Russian River. 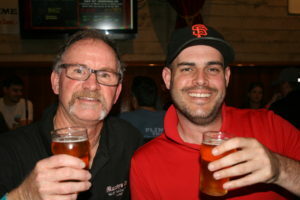 I was fortunate to meet three young fellows on Black Tuesday at The Bruery this past October. 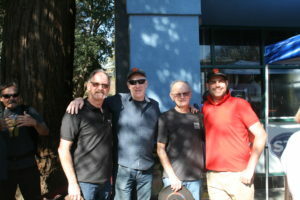 These men were from Santa Rosa and suggested that I visit three small breweries in town – Plow Brewing, Cooperage Brewing, and Moonlight Brewing. It just so happens that all three of these breweries are close to each other, and just a few miles away from RR. Unfortunately we won’t have time to visit all three, so we’ve chosen to visit Cooperage Brewing. If you were not aware, Russian River Brewing has opened another facility (brewery and bistro) a few miles up the road from their Santa Rosa location. We are hoping that the new facility (much larger than their SR brewpub) will draw off a significant portion of the crowd from Santa Rosa, resulting in shorter wait times. I’ll let you know how that works out for us. And, by the way, this year Sheila is attending the PTY madness with us at Russian River (last year she went wine tasting while I was beer tasting). She will be the sole female in our group that day, but I have no doubt she will be able to hold her own (and she loves IPAs). I’m sure you’re all anxious to know what is currently being offered at Mac’s. Here is the current and soon-to-be available beer list. This is one of my most requested and sought after brews, second only to Goldihops (Honey Blonde Ale). It’s really easy drinking with the low alcohol and bitterness, and Oktoberfest style beers are very popular. I brewed this alone, so I had 10 gallons for consumption at Mac’s Brew Pub, and that’s why it’s still on tap (since the beginning of September 2018). For additional description, see my newsletter of September 17, 2018. San Andreas Malt: Brewed September 19, 2018. 5.4 on the Richter Scale, 43 IBU. This is a California Common style lager brewed in collaboration with my friend, Jeff Nash (see Newsletter of September 17, 2018, for additional information on this beer style). This was a new recipe and first time brewed. That usually means tweaking the recipe and process for subsequent batches in order to get the beer I envision. However, this turned out fantastic and I don’t plan on changing anything with future batches. It’s a medium amber color with a slightly malty aroma, but not sweet. The flavor is clean, crisp and hoppy, but with a nice moderately rich malt foundation (bread, toast, caramel and grainy) and dry finish that makes it well balanced (but definitely on the hoppy side). It’s very similar to (but not a clone of) the standard bearer in this style category – Anchor “Steam Beer”. San Andreas Malt is so good it’s shaking my world! Wide Awake Drunk: Brewed November 7, 2018. 5.0% ABV, 45 IBU. Reefer Nearness: Brewed January 6, 2019. 7.1% ABV (so far), 127 IBU. Designed and brewed in collaboration with another young brewing friend, Bryce Lowrance, this is a West Coast style IPA using Nugget hops for bittering, and Azacca and Idaho 7 hops for aroma and flavor. It’s currently dry hopping and in the final stages of conditioning. When I last checked (11 days ago) it was 7.1% ABV, but could possibly go just a bit higher – I’ll know when I keg it on January 31st. I’m sure you all want to know where the name of this beer (“Reefer Nearness”) comes from, so here’s the story. Is there anyone in this country who hasn’t seen, or at least heard of the movie, “Reefer Madness” (a 1936 propaganda film)? Of course not. What is not so widely known, however, is that hops (Humulus Lupulus) are a close cousin of cannabis. Yes, it’s true (next time you have a chance to smell some hops, note the pungent “skunky” aroma), but of course hops have no THC, the psycho-active component of marijuana. My point is this: hops are very NEAR TO MARIJUANA. Because of this close relationship I’ve always wanted to name an IPA something along the lines of “Reefer Madness”, but of course it’s not actually reefer. Thus, “Reefer Nearness– The Bitter Pill That Makes Life Sweet” was born. Reefer Nearness is still conditioning, so I have not yet tasted it. I only hope it’s good enough to cause as much of a stir as its namesake (“Reefer Madness”). I think my next brew will be Goldihops. I plan to brew it in mid-February after returning from Santa Rosa. I need to start looking for a brewing partner for this one. In 2018 I did not enter any brewing competiions – we were too busy travelling. 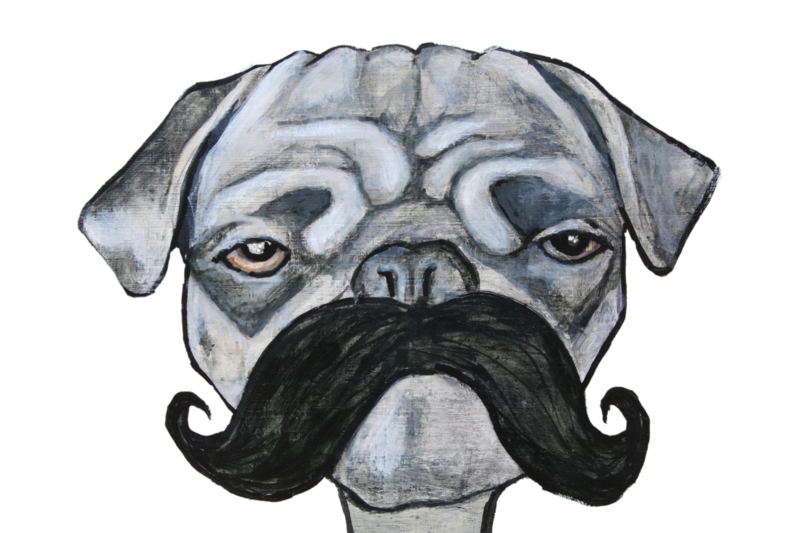 I plan to enter some of my brews into a couple of competitions this year. The American Homebrewers Association national competition is coming up soon and I think I will enter San Andreas Malt and Maktoberfest. I’m considering Wide Awake Drunk, and I may enter Reefer Nearness, depending on how it turns out. If I can get Goldihops brewed in time, I will also enter that into the national. The Orange County Fair competition is coming up in May, so I have to start thinking about entries for that competition as well. Well, that’s all I have time for now, and of course, that’s about all you have time to read today (sorry this got so lengthy). 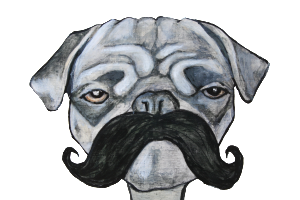 Check in again soon, or subscribe to macsbrew.com to get all the latest news and beer reviews. I’ve been telling you that I have lots of notes on beers I have sampled in the last year, but have not taken the time to post the reviews. Today I start catching you all up on what’s good to drink out there. Today it’s two beers from Reuben’s Brews in Seattle. Please read responsibly! “Bits and bobs” is a British term that means “bits and pieces”. In this case, Reuben’s will be releasing this on a seasonal basis, but it will be different each year, based upon the bits and pieces the brewers have learned since the last release. This is a review of the 2018 version, released in January 2018. I drank a bomber of this in early March 2018. Unfortunately I didn’t realize this was a one-off seasonal, so I apologize for the lengthy delay (it almostmakes this review meaningless and obsolete). It probably wouldn’t have mattered anyway, as this is not available outside of the State of Washington. Since you can’t get this version any longer, I guess my description is just going to have to satisfy you. Reuben’s Brews Bits & Bobs. Forgive the wine glass – that was the only thing available at The Gosby House in Pacific Grove. Bits & Bobs is an IPA. It pours a crystal clear, pale, yellow color with a ½” white head of foam that fades after about a minute, to a thin covering and a ¼” ring. The aroma is citrus – orange, grapefruit and lemon. The flavor is bitter grapefruit and lemon, but it’s not overly bitter. Some malty sweetness makes an appearance late on the palate. The lingering aftertaste is bitter, but not unpleasant. It’s clean and dry, very crisp for an ale, with medium-light body and moderate carbonation. This beer is very drinkable. 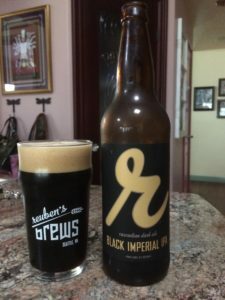 Black Imperial IPA: Reuben’s Brews, Seattle WA. 8.1% ABV. Reuben’s calls their Black IPA a Cascadian Dark Ale (in case you’re not aware of it, Cascadian Dark Ale is another style name for Black IPA). This one pours midnight black with a 1” creamy beige head. The aroma is hoppy, with citrus and chocolate notes. The dark malts predominate in the flavor over the hops, but just slightly so. It’s roasty and chocolate with slight peppery notes from the rye malt. The hops kick in mid palate, with citrus and grapefruit bitterness. It fades to a mellow combination of roasty and bitter, with a lingering bitterness in the aftertaste. The body is medium, which was somewhat of a surprise given the creamy thick appearance of the head. Carbonation level is medium. This is an Imperial IPA with the typical bittersweet profile, except the sweetness from the malt is quite subdued. Instead, roastiness mixes with the hoppy bitterness to create that bitter chocolate citrus flavor that is so common in these Cascadian Dark Ales. This is one of the better ones – very good! 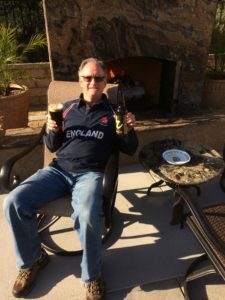 Mac enjoying a Reuben’s Brews Black Imperial IPA in front of the outdoor fireplace at Mac’s Brew Pub, April 27, 2018. I can highly recommend both of these beers. Bits & Bobs is released annually in in limited quantities in January and February. Of course it will taste different each year as the recipe is revised yearly. Black Imperial IPA is released annually in November and December. Black IPA’s have faded in popularity and are getting hard to find these days (e.g., Stone Sublimely Self Righteous Black IPA was discontinued a couple of years ago; see my review of SSR posted 11-26-2012). Get this one while you still can. It won a gold medal at the 2015 World Beer Cup. Both of these beers (22 oz. bombers) were given to me by my uncle, Kevin McCaffrey, who lives in Seattle (thank you Kevin for your generosity). See you on February 6, 2019 at Russian River Brewing. We’ll have Pliny The Younger again, and raise a toast to The Younger, The Elder, and to Mac’s Brew. GREETINGS, BEER AFICIONADOS. The holidays are over, and I’ve been on two vacations since the beginning of 2018. Now it’s time to bring you some beer wisdom. Please read responsibly! I haven’t brewed since October (Lights Out, black IPA). I was too busy with our outdoor fireplace project and then the holidays. In mid-January, we went to Italy and Spain for a couple of weeks, then the first week of February I went to Santa Rosa to score some Pliny the Younger. I’m hoping to brew in the next couple of weeks. I really need to get going because I’m running out of beer at Mac’s (only 4 beers on tap right now, with two taps empty and a third nearly empty). Ok, so what about Italy and Spain? Sheila and I were on a cruise ship in the Mediterranean, with stops in Italian and Spanish ports of call. We were travelling with Rose, Don and Donna Evans. Well, the beer scene there leaves much to be desired. 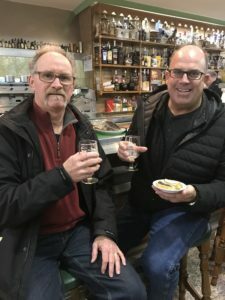 There is a well known craft brewery in Northern Italy (Baladin), but we never made it to the north, and I was unable to find Baladin anywhere in Tuscany, Rome, or Southern Italy, including Sicily. The beer was pretty much limited to Peroni and Birra Moretti (both are so-so, uninspiring lagers available stateside; don’t waste your time – I didn’t). Heineken was also widely available. Now if you’re looking for wine, that’s a different story – it’s everywhere, and it’s very good. 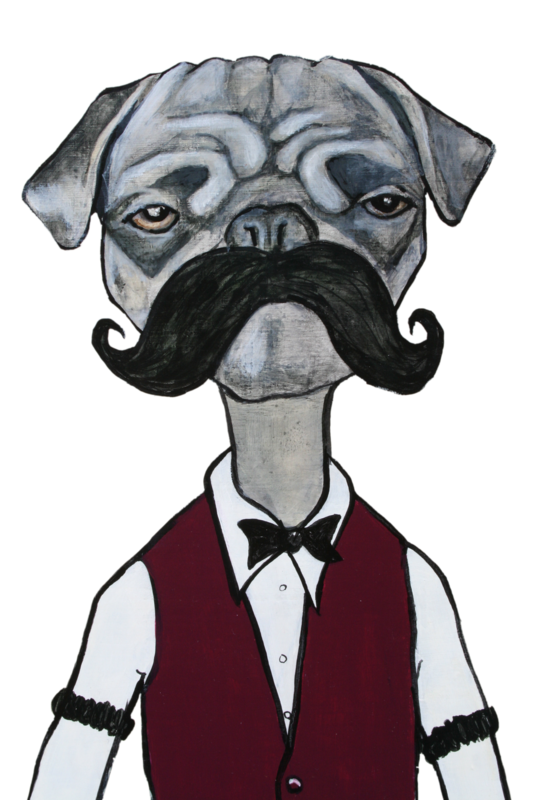 I much prefer red wine, with it’s more complex and robust flavor, to white, and I certainly had my fill of it in Italy. On board the ship, they had a great black lager (Köstritzer, 4.8% ABV), a porter (Carnegie Porter by Carlsberg, 5.5% ABV) and a Belgian double amber (Grimbergen Dubbel Ambree, 6.5% ABV), so I was able to have some good beer for part of the trip. My go to beer on board was Köstritzer, but I also drank the Carnegie Porter on occasion. Don (my brother-in-law) and Sheila drank the Grimbergen almost exclusively (it was good, but not my style). Donna stuck with a light colored draft Pilsner (I believe it was Carlsberg). Note: Donna – we gotta coach you up and expand your horizons; there’s a lot of good beer out there waiting for you to sample. In Spain the beer situation is a little better, but still underwhelming. San Miguel brews some decent beer, but doesn’t offer much variety. In Madrid I drank some Cruzcampo Gran Reserva. It was a good (not great) amber lager that had a little more flavor than a typical pilsner. I had never heard of Cruzcampo, but have since learned it is Spain’s largest beer producer. This Gran Reserva was the best beer I found in Spain, but I don’t plan on looking for it at home. Now let’s talk about some real beer. On February 5, 2018, I left home on a pilgrimage to Russian River Brewing in Santa Rosa, California, in order to secure some Pliny the Younger – a triple IPA. This beer is consistently rated among the top five beers in the world. It is brewed once a year and is served on tap only, beginning the first Friday of February and for two weeks thereafter. There are a VERY few locations in Orange County where this wonderful beer is also available during this time, but the waiting lines are prohibitively long, so I have never tried. If you want to get some PTY at Russian River, plan on going to the brewery during those two weeks in February, and waiting in line for a couple of hours (or up to 6 – 8 hours on the weekend). I went with my father, Bob Waddell, and met my uncle, Kevin McCaffrey (from Seattle, WA), and cousin, Jordan Schiller, at Russian River Brewing. Going to Santa Rosa and drinking PTY was a bucket list thing for me, and is something Uncle Kevin and I have been talking about doing for 3 – 4 years now. After driving over 500 miles and waiting in line for more than two hours, I must say the reward (three ½ pints of PTY) was worth all the effort, and I will definitely do it again in the future. Pliny the Younger is marvelous! If you’re an IPA lover and have ever had Pliny the Elder, you know how good it is and how loaded it is with juicy citrus flavors. We shared a pint of Pliny the Elder to taste alongside our Pliny the Younger. Although PTE itself is a hard and hoppy punch in the mouth, it tasted washed out compared to PTY. I say that to say this: If you like Pliny the Elder, you’re gonna love Pliny the Younger. You just gotta have some. It’s hoppy and bitter, but has a huge malt foundation that sweetens the bitterness and creates a very complex IPA. The hoppiness is bigger than PTE, but I would also say it’s more balanced due to the increased maltiness. The body is also heavier, thicker and smoother, lending additional complexity to the brew. The ABV is 10.25%, compared to PTE, which is 8.0%. The higher alcohol is not prevelant in the flavor, but is definitely warming in the throat and thus is more noticeable. If you’re and IPA lover, this beer is a dream come true. Is it really that good, or am I responding to all the hype, the difficulty obtaining it, and the time and effort involved? Would I rate it so highly if it was easy to obtain (like, for example, Lagunitas IPA)? If I didn’t know that it is annually rated among the greatest beers in the world, would I still gush over it? Of course my answer is only speculation, but I believe I’m being objective when I heap all the afore mentioned praise on Pliny the Younger, and when I say it is definitely as good as advertised, possibly even better. I have an idea . . . why don’t you go to Russian River Brewing next February, have some PTY and decide for yourself. Then you can be the judge. Well, I need to close out this newsletter before it gets so long that you lose interest. I need to come up with a recipe for my next brew (an IPA), and spend some time posting more beer reviews. Sooooooooo, that’s it for now, but check back soon for more of Mac’s beer wisdom. Better yet, subscribe to Macsbrew.com now and you’ll be notified whenever a new post is added. Greetings to all you beer geeks and fans of Mac’s Brew. It’s been a couple of months since my last post, so it’s going to take awhile to bring everyone up-to-date. I have been out of town a lot and have only brewed once since my last newsletter, but there is still a lot I want to share. I will try to keep it brief. Please read responsibly. So, Mrs. Mac and I just celebrated our 35th anniversary. We went on a three week road trip to the Pacific Northwest, going as far as Seattle, Washington. The vacation was amazing, if a little long, hi lighted by visits to numerous breweries along the way – some well known, some hardly known. I made it a point to find local craft breweries in most of the cities where we stayed overnight, and went out of our way to stop at some other breweries. Altogether it was a memorable trip with numerous hi lights. 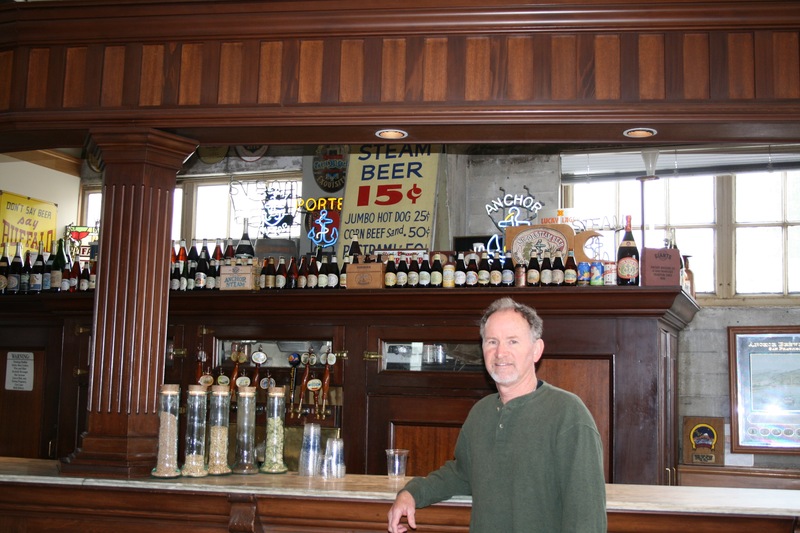 Anchor Brewing, San Francisco: This is where the American craft beer revolution began, thanks to Fritz Maytag’s purchase of the nearly bankrupt brewery in 1965. Excellent tour, and great beer. The fun time was tempered a bit when we returned to our car to find it had been broken into, but all stolen items were recovered by San Francisco PD (no doubt “Dirty” Harry Callahan was on the case); good job by SFPD. The tour was very informative, and the beer sampling was extensive and excellent. This brewery is small and old. It’s amazing that all of the Anchor brews, which are so widely available, come from this small location. Lagunitas Brewing, Petaluma, CA: Dinner and a beer at their brewery/taproom/restaurant while driving to Mendocino. Very good (both the food and beer). We had planned to eat lunch here and then have dinner at North Coast Brewing in Fort Bragg, but the car break-in threw off our plans for that day. 7 Devils Brewing, Coos Bay, OR: Lunch and beer at their brewery/taproom/restaurant while spending the afternoon in the quaint downtown area of Coos Bay on Saturday 04-02-2016. This was the only brewery I could find in Coos Bay, but it has a bright future. The brewery is small, as is the taproom/restaurant, but the beer is excellent, the food is good and the ambiance is very nice. Ecliptic Brewing, StormBreaker Brewing, Hopworks Urban Brewery, Portland, OR: Walking brewery tour by Brewvana Portland Brewery Tours on Monday 04-04-2016. All three are small breweries with taprooms/restaurants. As most beer lovers know, Portland has an extensive craft beer scene (the city claims to have more breweries per capita than any other city in the world). Our Brewvana tour guide, April, was well informed and gave a great presentation, including lots of information about beer in general, the craft beer scene in Portland, and about the Mississippi district of Portland, where our walking tour took place. Ecliptic Brewing: Just beer tasting at Ecliptic, with a 15 minute tour of the on-site brewery. It’s very small (10 barrel system, if I recall correctly), but the beer is EXCELLENT! The food was highly recommended so we came back the next evening for dinner at the pub. We were not disappointed. This was a great place for beer and food in a relaxed atmosphere. The Orange Giant Barleywine was my favorite (one of the best barleywine ales I have ever tasted). The Oort Imperial Stout was also top notch. StormBreaker Brewing: Good beer in the taproom, but we did not eat any food there. The menu is extensive for a brew pub, but we didn’t have time to go back and try the food. Hopworks Urban Brewery Bikebar: The Bikebar was a taproom/restaurant, our final stop on the Portland walking brewery tour. In addition to sampling the beer here, we ate a lot of appetizers at HUB Bikebar. This was the largest of the three on the tour (they have two locations in Portland) with the largest selection of beers. Very good! ScuttleButt Brewing, Everett, WA: We ate dinner at the ScuttleButt restaurant/taproom with my nephew Joel and his family. It’s in the harbor area with a nice view; the restaurant is large, and family friendly, with a menu featuring lots of seafood and good beer. Chuck’s Hop Shop, Cloudburst Brewing, Rueben’s Brews, 74th Street Ale House, Seattle, WA: This guided brewery & pub tour was planned and hosted by my uncle, Kevin McCaffrey. We went to one independent taproom, two breweries and one pub over the course of the afternoon. Seattle, similar to Portland, has a very vibrant craft brewing scene. Kevin put a lot of effort into planning this tour, but we barely scratched the surface, so I guess I’m just going to have to return someday soon to check out more breweries. Chuck’s Hop Shop: This is an independent taproom, featuring beer from numerous local breweries. They also have an extensive bottle shop with craft brews from all over the U.S. and the world. I almost scored a bottle of Parabola here, but the proprietor sold it out from under me (too involved to give more details now). When in Seattle, you should go to this place. Cloudburst Brewing: Open only since January 2016, Cloudburst is small, but was one of Seattle’s most anticipated brewery openings. Their coffee milk stout, Jump Sturdy, is FABULOUS! Actually, all of their beer offerings were first rate! I went here a couple of times while staying in Seattle as it was walking distance from Pike Place Market and our hotel. 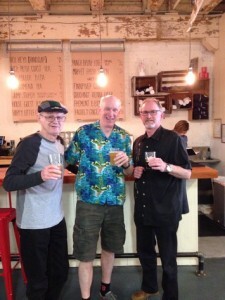 I met the brewer, Steve Luke, and had a pleasant conversation with him on my second visit to Cloudburst. Reubens Brews: This location was the production brewery and taproom. They had an extensive selection on tap, and everything I tasted was excellent. This brewery opened in 2012, but is already heavily awarded, including gold at GABF. 74th Street Ale House: We went here for the salmon sandwiches, but they also have almost 20 beers on tap. You’re right, Kevin, the salmon sandwiches are OUTSTANDING! The Pike Brewing, Seattle: Sheila and I went to the taproom/restaurant for beer sampling on Friday afternoon, 04-08-2016. Everyone has heard of The Pike’s Kilt Lifter Scotch Ale, but they also have a large selection of other brews that are very good. We didn’t get to tour the brewery (next door to the taproom) unfortunately, but the restaurant/taproom is really cool (and very large)! It’s in the Pike Place Market and is a “must see” when visiting Seattle. Elk Horn Brewing, Eugene, OR: We played scrabble and drank beer here on Sunday afternoon, 04-11-2016. The beer was good enough that we returned for dinner in the restaurant/taproom. Both food and beer are decent. It’s located just down the street from University of Oregon. Sierra Nevada Brewing, Chico, CA: We drove out of our way to get to Chico, but it was well worth the time and effort. 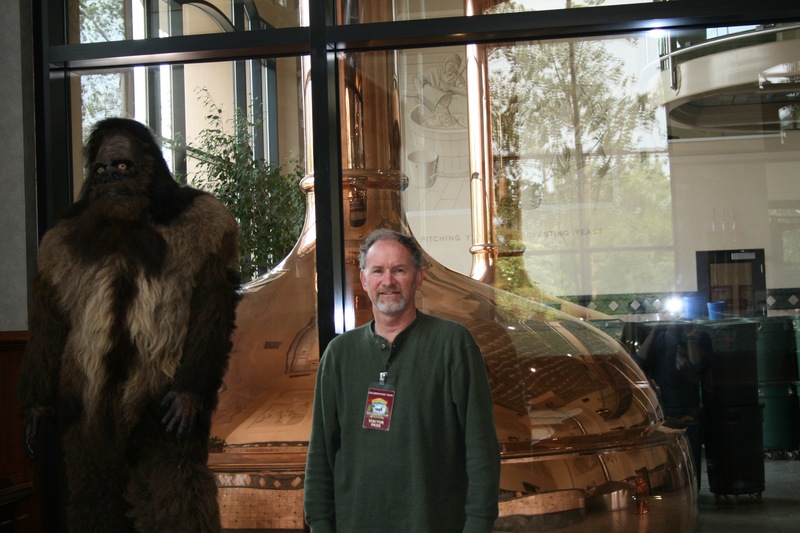 We toured the iconic Sierra Nevada brewery on Tuesday 04-12-2016. I have toured a lot of breweries, but the Sierra Nevada tour is in a league by itself. Sierra Nevada is the 7th largest brewery in the U.S., and is by far, the largest brewery I have ever seen. I know many of you have toured Stone Brewing in Escondido, CA, and have been impressed (like me) with the brewery size and volume of production. Well, Sierra Nevada dwarfs Stone. It’s simply amazing – not just the size, but the cleanliness, layout, commitment to the craft, and leadership of Sierra Nevada. We had to make reservations in advance to get on the tour, but there was no charge. They allowed extensive sampling, which unfortunately I had to moderate because I had a long drive afterward. We ate lunch at the restaurant, which is on-site. The food, like the tour, was excellent and the atmosphere was really great, much like the Stone Bistro. I can’t say enough good things about my experience at Sierra Nevada Brewing; it’s simply incredible, and I’m very glad we took the extra time to go there. 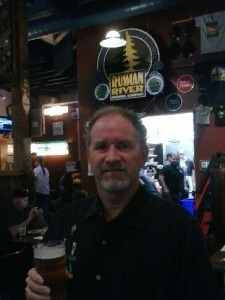 Russian River Brewing, Santa Rosa, CA: We stayed two nights in Santa Rosa on our way back home. On Tuesday 04-12-2016 (after the tour and lunch at Sierra Nevada) we ate dinner at the brewery/taproom/restaurant with my uncle, Dennis McCaffrey. The food was VERY good, but the big deal here was that I had a pint of draught Pliny the Elder at the brewery!! It just doesn’t get any better than that. After dinner, I had a glass of Consecration (sour dark ale aged in Cabernet barrels) – absolutely delicious. The Pour House, BarrelHouse Brewing, Firestone Walker Brewing, Paso Robles, CA: I had an afternoon to kill in Paso Robles (Thursday 04-14-2016) when we were heading home after almost three weeks on the road. I decided to kill the time sampling more beer. I have been to all three of these places in the past and knew I could get some good beer. The Pour House:is a non-affiliated taproom, pouring a large variety of good beers. It’s a little off the beaten path in a nondescript commercial building, but obviously the locals know it well. One beer there (while Sheila got her nails done) and then on to BarrelHouse. BarrelHouse Brewing: This place has really good beer. I had a glass of Curley Wolf (bourbon barrel aged IRS) and Sheila had a glass of Sunny Daze (a citrus blonde ale). They don’t serve food here (pretzels only), but food trucks frequent the location (or you can bring your own food). The Curley Wolf is EXCELLENT, but is high in alcohol, so I had to limit myself to one because I was driving. Firestone Walker Brewing: Less than two miles from BarrelHouse, Firestone Walker is of course one of the best known and highly awarded breweries in California. The Paso Robles location houses their brewery, with the taproom/restaurant right across the street. I had a Luponic Distortion IPA with dinner. The food at the restaurant is very good, and the Luponic Distortion was quite good also. In addition to visiting all these breweries, we did a wine tasting tour in Sonoma (with Dennis and Stephanie), and went to numerous other memorable establishments along the way: Klub Klondike – “Best Dive on the I-5”; North Star Cafe – “Voted #1 Happy Hour by Betty Ford Clinic;” Voodoo Doughnuts; the original Starbucks at Pike Place Market; and The Buena Vista (for Irish Coffee) to name a few. Well, this is a short summary of our 35th anniversary road trip and brewery tour. If you are going to any of these areas in California, Oregon or Washington, you might seriously consider adding some of these locations to your plans. The hi lights include: Anchor Brewing (San Francisco); Ecliptic Brewing (Portland); Cloudburst Brewing for the beer/The Pike Brewing for the ambiance (Seattle); Sierra Nevada Brewing (Chico); and Russian River Brewing (Santa Rosa). One other thing I need to add in regards to all of these breweries and taprooms: The beer in Portland is unbelievably cheap. The pints were typically between $3 – $4 at all the places in Portland, and throughout most of the state. The tour guide in Portland (April, with Brewvana) explained some of the factors – the breweries are close to the suppliers for malt and hops, and the water is so good and pure in Portland that they typically do not need to treat the water via reverse osmosis, so their production costs are lower than most other regions of the country. Oh, and there is no sales tax in Oregon, so when the price of your pint is listed as $3.00, you pay only $3.00 (of course, any conscientious person will also add a tip). A special thank you is extended to two of my uncles – Kevin in Seattle, and Dennis in Santa Rosa. Both of you helped to make this road trip special and memorable. I hope to see both of you again soon. Remember Mac’s Brew Pub is always open with good beer on tap. For you, Dennis, we will have Coke, and wine for Stephanie. Thanks again! And to my nephew, Joel, in Lynwood, thanks for your hospitality. We enjoyed our time with you; your family is the best! Thanks to all of you for the special memories. 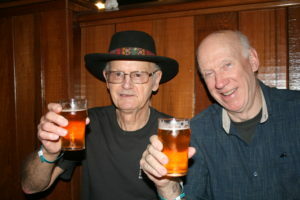 Oh, and to Kevin and Joel, I left you some bottles of Mac’s Brew – I hope you guys enjoy it; it’s a pleasure to share my creations with two fine fellows who appreciate good beer. Unfortunately this newsletter is much longer than I intended. I hope you were able to read through to the end. 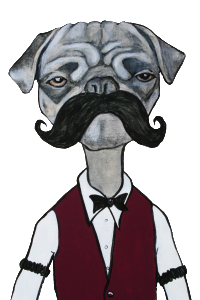 The next newsletter, with updates on what’s happening at Mac’s, will be published very soon.